I know it's Super Bowl weekend but in the needlepoint world it is the weekend when needlepoint shop owners are buying canvases and accessories with which to tempt stitchers over the weeks and months to come. Shop owners are at TNNA market in Long Beach, California this weekend and many of them are taking us along with them - virtually. Thanks to social media, stitchers are able to see the latest offerings of their favorite and soon-to-be favorite designers. Having been a buyer for several retail stores, I know first hand how much effort goes in to "working" the trade show floor. Add to that job the work required to keep customers abreast of all the new designs via Twitter, Facebook, and blogs and you can only imagine what our shop owners are trying to juggle at this show. Let's give a big round of applause to shop owners and designers across the country for the great job they are doing to keep us apprised of the temptations that are to be found at the market! I have several things on my wish list. I'll be narrowing it down as the day goes along. However, I have already ordered Julia Snyder's new book Great Layers for Needlepoint and a new white sheep magnet from Mag Friends. Before I order any more canvases, I suppose we ought to look at the ones I am trying to finish before any new ones make their way into the stash! Another From Russia with Love egg was finished this week and a new one was started! 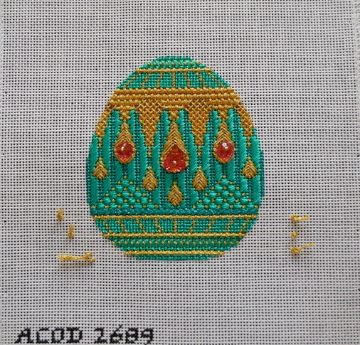 Stitching these eggs is just like eating potato chips - you can't stitch just one! Here's a photo of the four that are finished. I may send these off for finishing this week. 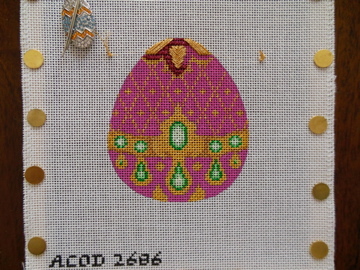 Last night I put a few beginning stitches in the Fuschia egg. 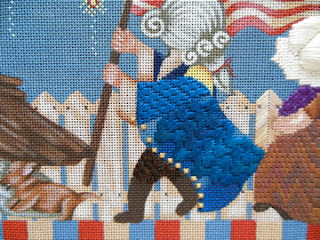 This week in the life of the July 4th March, I made a little progress on the flag bearer's coat. The coat is actually a small area to stitch but it takes a deceptively large amount of time to stitch it. Lots of stitches to be laid with the laying tool! This week I hope to finish up his clothes and boots and move on to his wig. I'm considering starting work on the sky once the flag bearer is finished. There's a lot of sky to stitch and I don't want to leave all of that to work on toward the end of the project. I have a nice, long afternoon and evening ahead of stitching and watching golf, football, and Downton Abbey. Didn't Downton Abbey just kill you last week? Wow, I wasn't expecting that turn of events and I won't say what happened in case you haven't seen that episode yet. If Maggie Smith doesn't win some sort of award for her short scene with Mr. Carson, there's just no justice in the world! I may have to turn on the Closed Caption option tonight if there are any more whispering prison guards in tonight's episode. Even after watching last week's episode a second time, I still couldn't understand what was being said about Mr. Bates. It was whispering so it had to be bad! I'm growing a little weary of Mr. Bates being in prison. Let's get on with a happy life for him and Anna! Well, I think it's time to make sure that the chips and guacamole are ready for the afternoon and evening. It's also time to check in on Facebook and see more new needlepoint canvases from the market. I know that temptation will get the best of me today! Yes, thanks to all the people at market who are taking us along for the ride. This year has many greats. I , too, am making a list and going to have to make decisions. 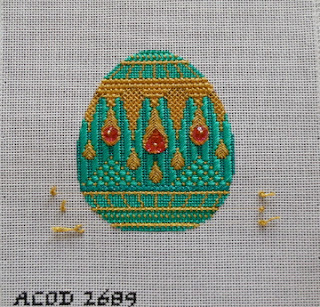 Wish we could all spend whatever we wanted on needlepoint. Your eggs are so precious. I am enjoying watching you and the other girls stitch them up. I can't wait to see the finishing!